There are currently 200 people online. 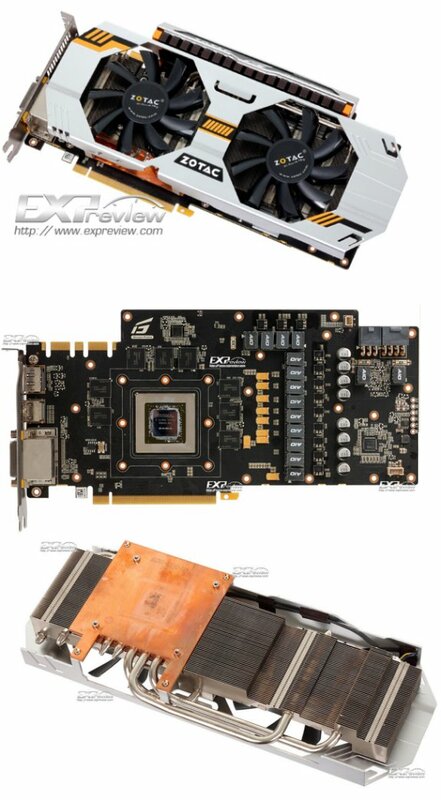 TPU came across some details and photos of Zotac's GeForce GTX 670 Extreme Edition over at Asian tech site Expreview. This new overclocker-friendly model will only be available in Asia though. The card ships with out of the box clock speeds of 1111 MHz (GPU base), 1202 MHz (GPU Boost), and 1652 MHz (memory actual), or 6.60 GHz (memory effective). It draws power from 6-pin and 8-pin PCIe power connectors, and conditions power using a 13-phase VRM that consists of noise-free chokes and PowIRstage DrMOS chips by International Rectifier. Power is further conditioned by a trio of multi-phase FPCAPs, and tantalum capacitors. Like the GTX 680 Extreme Edition, the card features the entire overclocker-friendly feature-set, including OC+ Module, dual-BIOS with LN2-friendly BIOS, voltage measurement points, temperature and phase loading LEDs. Cooling the beast is the same swanky cooling solution as the one found on the GTX 680 Extreme Edition. Staying within the confines of 2 expansion slots, the cooler packs a large aluminum fin heatsink that spans the entire length of the card, which uses five 8 mm-thick nickel-plated copper heat pipes that draw heat from the copper GPU base, to the aluminum fin stack. The heatsink is then ventilated by a pair of 92 mm fans.